(Nanowerk News) Every year, thousands of people across the world lose an arm or a leg. “Our technology helps amputees to control an artificial limb, in much the same way as their own biological hand or arm, via the person's own nerves and remaining muscles. This is a huge benefit for both the individual and to society”, says Max Ortiz Catalan, industrial doctoral student at Chalmers University of Technology in Sweden. Today’s standard socket prostheses, which are attached to the body using a socket tightly fitted on the amputated stump, are so uncomfortable and limiting that only 50 percent of arm amputees are willing to use one at all. This research project is using the world-famous Brånemark titanium implant instead (OPRA Implant System), which anchors the prosthesis directly to the skeleton through what is known as osseointegration. “Osseointegration is vital to our success. We are now using the technology to gain permanent access to the electrodes that we will attach directly to nerves and muscles", says Max Ortiz Catalan. In this project ("Natural control of artificial limb through an osseointegrated implant"), the researchers are planning to implant the electrodes directly on the nerves and remaining muscles instead. Since the electrodes are closer to the source and the body acts as protection, the bio-electric signals become much more stable. Osseointegration is used to enable the signals inside the body to reach the prosthesis. 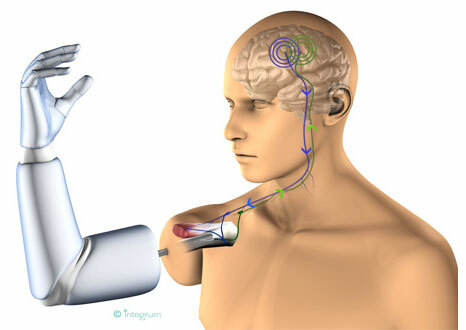 The electrical impulses from the nerves in the arm stump are captured by a neural interface, which sends them to the prostheses through the titanium implant. These are then decoded by sophisticated algorithms that allow the patient to control the prosthesis using his or her own thoughts. When amputee patients have received their new prosthesis, it will be controlled with their own brain signals. The signals are transferred via the nerves through the arm stump and captured by electrodes. These will then transmit the signals through a titanium implant (OPRA Implant System) to be decoded by the prosthetic arm. The prosthesis is anchored directly to the skeleton by a process known as osseointegration. Osseointegration (osseo=bone) is a method for anchoring prostheses directly to the skeleton, and it was developed in the 1960s by Professor Per-Ingvar Brånemark. He discovered that titanium is not rejected by the body, but is integrated into the surrounding bone tissue. In the beginning, the method was used to treat tooth loss using dental titanium implants. Since then, the method has been further developed and is also used today for leg, arm and face prostheses as well as for anchoring hearing aids. Since 1990, over 200 amputees have been treated using this method (OPRA Implant System) and have gained increased movement and enhanced quality of life. The artificial hand can mimic a living hand. The motors in each finger can be controlled individually and simultaneously, for example, with a turning motion of the wrist. It is possible to demonstrate how the system works by using electrodes which capture myoelectric signals on the surface of the arm.